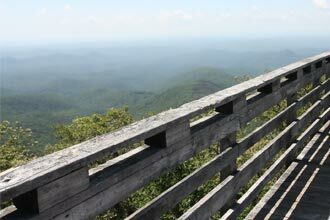 As Georgia's second highest mountain, Rabun Bald rewards hikers with a commanding view of the surrounding landscape from atop a stone observation tower at the summit. With visibility up to 100 miles on a good day, hikers can watch the mountains disappear like the ocean over the horizon. In the warmer months, strong winds battle the summer sun to keep you cool and warm at the same time. 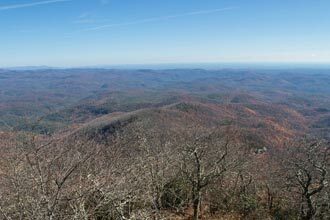 A popular destination along the Bartram Trail, Rabun Bald is a place you will not want to leave. Hikers have several trail options to choose from depending on how long or difficult you want your hike to be. In reality, you should hike them all as the view gets sweeter with each visit. The shortest and most popular option, Beegum Gap lies just 1.6 miles due north of Rabun Bald's summit. A short spur trail quickly connects you to the Bartram Trail, travelling south and climbing almost 1000 feet to the top. 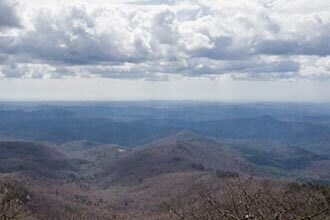 At almost 4,700 feet, Rabun Bald offers hikers one of the best views in the state atop an observation tower that takes you above the surrounding trees. This hike should be on your short list. Hike southbound along the Bartram Trail for this longer version of the Beegum Gap hike. Crossing several creeks and passing a small waterfall, this hike starts off peaceful before the inevitable ascent. A moderate distance and difficulty. Hike southbound along the Bartram Trail to the summit of Rabun Bald, Georgia's second highest mountain. From the stone observation tower you'll be rewarded with 360-degree views of Georgia, South Carolina, and North Carolina. Further south on Hale Ridge Road, the Rabun Bald Trail is the more difficult route, asking you to climb over 2300 feet in less than 3 miles. But the more challenging the hike, the more rewarding the view. You'll definitely earn this one. Rabun Bald's observation tower takes you above the trees to offer massive views in all directions. If you don't think this is the best view in Georgia, you're wrong.